SANFORD - For the first time, Central Carolina Community College is fielding a cross country team this fall. Jacob Ashworth, a former cross country coach at Lee County High School, has been selected to serve as the CCCC cross country coach. "The opportunity to build the program from the ground up is the most interesting and exciting aspect of coaching CCCC," said Ashworth. "I will be able to continue to share my love of the sport while implementing the tradition that is often times associated with a cross country team." Coach Ashworth will be assisted by Coach Clifton Scarborough. "I'm looking forward to a fun and challenging season, working alongside Coach Ashworth as we help our athletes become their best during and outside of competition." Coach Ashworth: "Brent is an incredible determined runner. He will be the workhorse of the team and is someone I am proud to build my program around." Coach Ashworth: "I coached Seth during his high school career and I am sure he will provide the team with the same humor as he did while in high school." Coach Ashworth: "Britt is an excellent runner with great work ethic and I expect huge things from Britt in the coming years." Coach Ashworth: "Grayson joined our team late. I had reached out to his high school coach last fall in an attempt to bring him to CCCC. I am thrilled that he has decided to join our program." Coach Ashworth: "Issac is was born to run. He is still very new to the sport but has great potential. I expect him to challenge Britt for the top spot on the men's team." Coach Ashworth: "Nuvia ran cross country at Southern Lee a couple of years. She is still relatively new to the sport and has a high ceiling." Coach Ashworth: "Lupe ran for me while I coached at Lee County High School. She was the class president and is an excellent student and I will be looking to her to step up and have a leadership role on the team." Coach Ashworth: "Alicia comes from very competitive distance running family and attended a high school with an exceptional cross country program. Her experience will be valuable to the team." Sept. 8 - Monarch CC Classic, Methodist University Campus, Fayetteville; Sept. 15 - Adidas XC Challenger, WakeMed Soccer Park, Cary; Oct. 9 - Hagan Stone XC Classic, Hagan Stone State Park, Pleasant Garden; Oct. 19 - Region X Championship; Nov. 3 - NJCAA Championships. 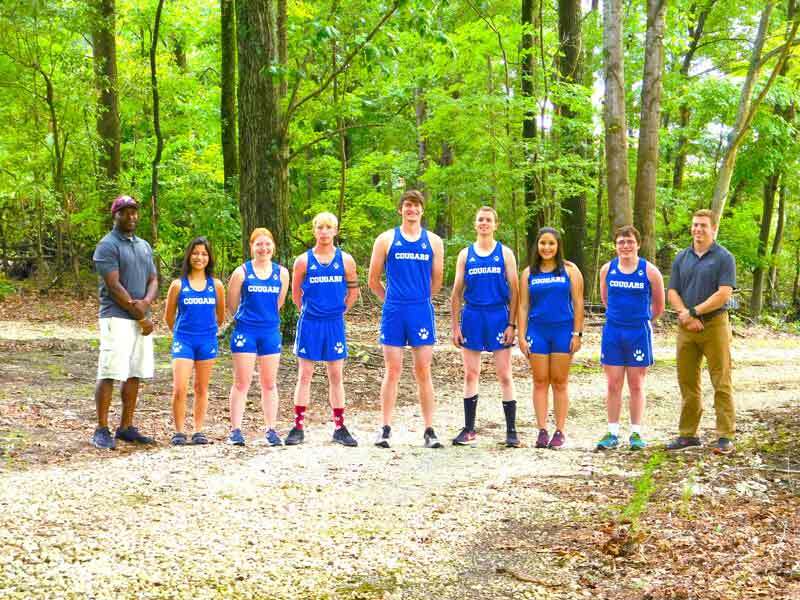 Members of the 2018 Central Carolina Community College cross country team are pictured, left to right: Coach Cliff Scarborough, Nuvia Guardado, Alicia Walker, Britt Lehman, Seth Hoyle, Issac Stoutland, Lupe Vasquez, Brent Holder, and Coach Jacob Ashworth. Not pictured: Grayson Lynch.